So, I'm trying to do some scrapbooking to get through my stockpile of photos. My desire to take photos diminishes as my backlog grows. This task requires me to pick and choose the photos I want to develop. I wanted to share a couple from our holiday battle royales. Not only did he buy the guns, but he wrapped them himself too. While he was wrapping, he realized the boys have multiple clips totalling 60 darts. 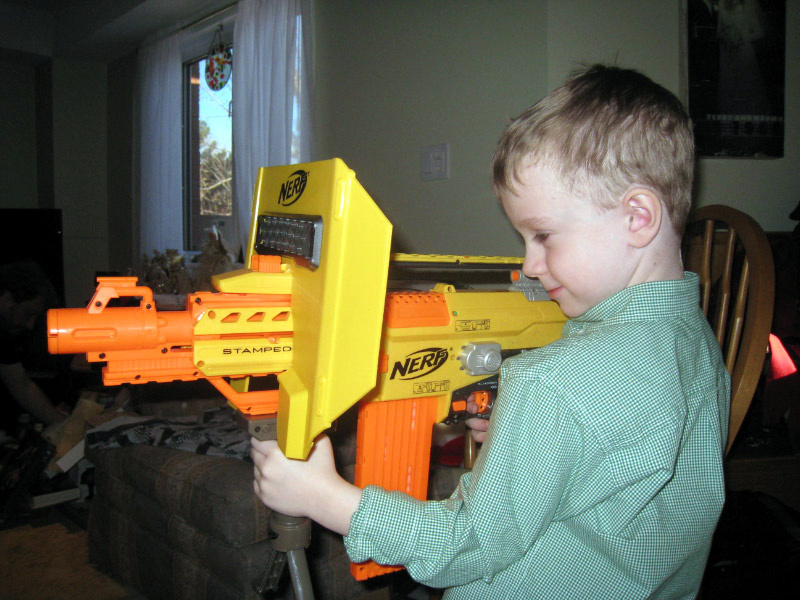 His Nerf gun had only one 25-round clip (of which he did buy two). He decided the ammo discrepancy was not going to be pretty if two nephews were unloading 60 rounds into him each! So, he went and got himself a different Nerf gun, which allowed another body to join in the game. We met with his side of the family first for the holidays, so David got his present first. He thoroughly enjoyed firing darts back and forth with Uncle Ryan. His dad and I scrambled to keep the clips filled - chasing darts all over. Even Poppa was helping to keep the clips loaded. Once, Uncle Ryan exclaimed "You're out [of darts]!" and David immediately shouted, "Load me up, Dad!" It sure doesn't take them long to grasp the concepts of weaponry. A few days later, we met with my family and gave them advanced notice not to come unarmed! Connor loved the Nerf gun. His dad, back left, used Ryan's first gun. Uncle Mike, back right, brought a dart gun with him and Uncle Ryan, in the front, has the same Nerf gun model as Connor. David's dad, who had to work for the day and could not accompany his family to an out-of-town family function, was invited to dinner. Ryan persuaded him to "borrow" David's Nerf gun too. There was a LOT of darts flying around. Here's a picture of the "reload" break. LOTS of darts. Connor's baby brother, Callum, who has just started to crawl, was fascinated by the flying darts and kept crawling towards them to snag the ones that landed. He just wanted to play too, but I'm afraid he's quite a bit smaller than the Nerf guns! Of course I have to include the third nephew in this post, so here is the most recent scrapbook page I did for his baby book. This is the most awesome picture I've seen. It could have come straight from a magazine! The most amazing part? It was taken in a grocery store! Yes, the photo lab at Fortinos (which is the top of the line grocery chain for Loblaws, one of the largest grocery chains in our area) took this photograph. Who needs props when you've got Daddy's Hands? !